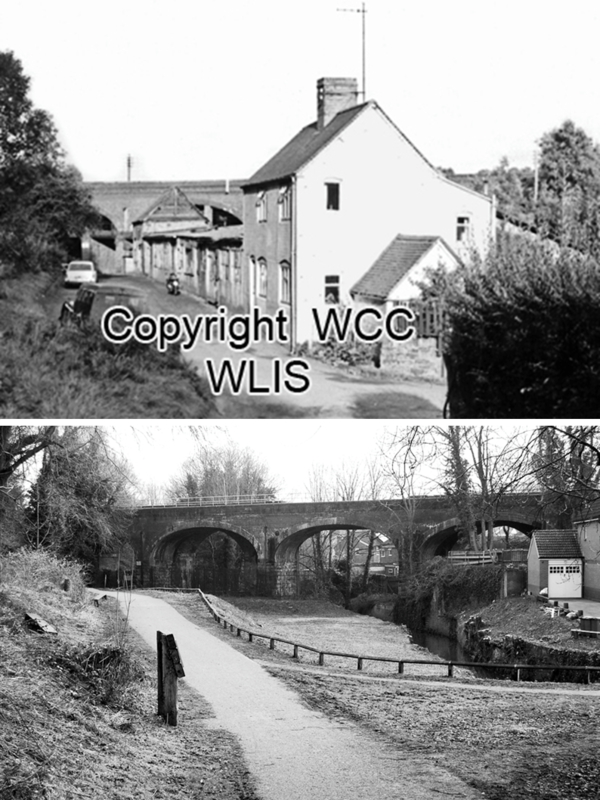 This week’s Then & Now comes courtesy of prolific local historian Robin Leach, whose recent research on Kenilworth’s involvement with animal skin processing, in particular on two major sites in the town centre and at Mill End, will soon be available in his forthcoming book Kenilworth People and Places, Volume 3 (2018). Henry Street established his fellmongers works at Mill End in 1855, moving from Spring Lane, and in 1871 he extended it across to the Common side of the brook on a plantation that had been separated from the Common at least by 1724. By the start of the Second World War the fellmongers had more or less ended and in 1946 the site was bought by Lester Stickley to use for his scrap metal business. The buildings were of little use and so from 1947 onwards he rented them out to, mostly, fledgling engineering industries and in effect it became the town’s first industrial estate. There were up to 9 or 10 industries on the site at any one time and as they expanded many of them moved and helped to establish the still surviving industrial sites across the town. The ‘Then’ photograph was taken 1965 by John Drew when just a few firms remained alongside the Common, including CWD Tools (Cross, Winters and Day) and CRS (Caterpillar Repair Services). The cottage had been built to house the fellmonger’s foreman. The site was redeveloped in 1999-2000, this area being returned to the Common for the first time in close on three centuries and the main site becoming Woodmill Meadows (the historical name of the two fields on which it was built). The ‘Now’ view was taken on 6th February 2018 after the vegetation had been cut down. Still in place are the brook-walls built during the time of the fellmongers that enclosed a re-aligned brook, the girders that once supported a railway siding into the works that are left as seating, and the concrete bases of a works under the railway arches. The full story of the site and Henry Street’s fellmongering business is told in Robin’s new book Kenilworth People and Places, Volume 3, which includes high quality reproduction of both photographs. Previous Post Vote for KHAS at The Worthies, 2018!